I had this all crocheted and just waiting to be put together. I decided to finish it up for a friend of a friend. She had expressed interest in getting something I made for her son to my friend and I just feel led to give this one to her. I met her at my friend’s baby shower and she was so sweet. Plus, I know how good of a friend she is to my friend. Now, back to the six legged thing. I used this pattern from Lion brand. Mine looks different probably because I used different yarn. When I went to add the legs I just didn’t like how all 8 looked on it. It was too much, so I just left it at six. 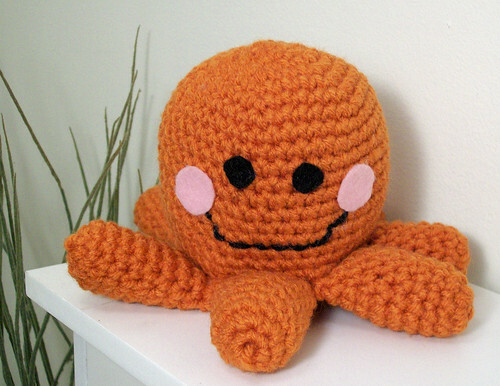 He is to be wrapped tonight so he can become a little boys new toy octopus.